A turn-based RPG about a turn-based RPG! Play as the mysterious "White-Hat Hacker" and help your fellow players achieve victory against a group of filthy cheaters! 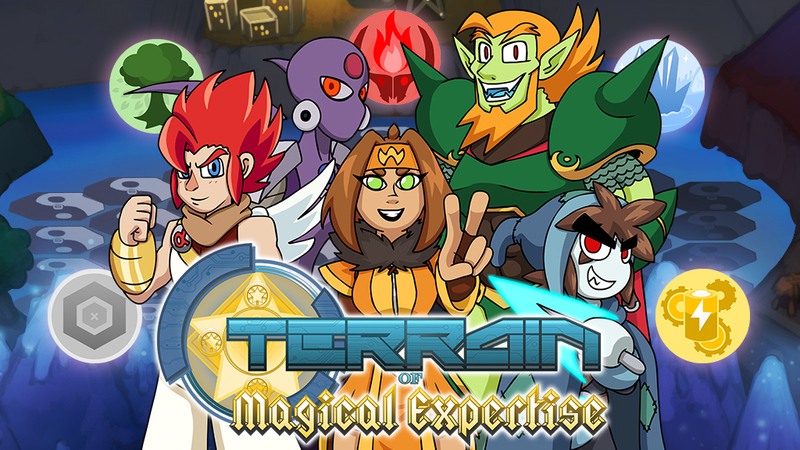 Based on the "Terrain of Magical Expertise" webseries by Chris Niosi! Download the zip, unzip it to a desired folder, and simply play via the executable. Widescreen resolutions recommended, Xbox 360 or Xbox One controller strongly recommended. So i downloaded the game and extracted the application and it says "Missing 'app.info' in Data folder" what is it telling me to do? I did a video about the TOME demo! I think it's pretty good and it does capture the spirit of the web series! I've been a huge fan for a while, Chris! Can't wait for the full release! The only thing I was expecting that I didn't get was the iconic BATTLE ON! when a grid was opened up. Really hope it'll be added to the full release! I've been a fan of TOME for so long now and it happened to slip off my radar, until I saw THIS! I have never been so excited for a game! So... I'm not if this first thing is a bug but I found it a little weird. I was looking through the menus and had to hit escape several times just to get out of everything. I looking through the items, sounds and controls, and when I wanted to go back to the game itself I had to back out and have all three menus reappear with my only hitting esc about five or six times. I know this second thing is a glitch. I was using my keyboard to play and as a fight started I mistakenly hit the enter key to bring up the menu. As soon as the little animate for the Father-Daughter Team attack had finished I was unable to do anything in battle expect watch the turn time tick down. This last thing is more a nit pick. But a skip speech feature would be nice for dialogue. Especially for those that are playing the demo over again. Especially for when you mistakenly talk to the NPC's more then once because your trying to get through it. Other then that, so far the demo's have been great. Personal I would love to see some general NPC's to talk to just to see other players bopping around the demo world, but I get that a lot of that is being held off till the full release. I've downloaded TOME, but my Mac isn't allowing me to open it. Thoroughly enjoyed the game and look forward to seeing it become a full thing. The only notes I would like to see once it is complete are as follows: first, I think it would be interesting if there were unlockable skins for party members that are important to the story. Second, I understand this is probably a plan, but I'd love to see more customization for the White Hat. The ability to create custom shapes for the slime characters by clicking and dragging, much like in PhotoShop or Flash, custom hairstyles for humanoids, etc. Third, unless you incorporate some sort of multiplayer, I like the idea of the white hat hacker just being called White Hat. Makes them seem more mysterious and interesting. Finally, and most importantly for me, movement in battle. I like the layout, but the way its set up appearance wise, it leaves me missing some form of movement similar to that of Mega Man: Battle Network. A lot of what made TOME fights so cool for me was the way characters moved, and while I understand that's more difficult to replicate in a game such as this, I think it would also add a lot in the realm of strategy and gameplay to allow you to move characters to different spaces during battle. Nylock with his "Whoosh! ", allowing him to move X spaces forward and dealing damage in that area. Alpha having the Vulcan Fist place him right in front of the enemy allowing for devastating combos. 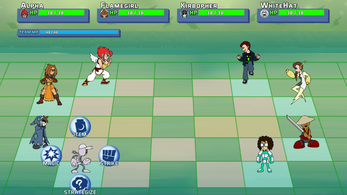 Adding a "Move X spaces" to the strategy tab, especially since many of the characters are primarily melee, so it forces range to be a factor in attacks, not just mana and damage. These are just a few ideas that I would like to see, and thank you for your time. Also, it reminded me of Super Mario RPG in the best possible way, and if I do not see a reference to the Waltz of the Forest, I will be extremely disappointed. I'am so hyped right now, and i wich you could continue a new season of TOME!! For me, Disappearing Alpha happened when returning to the overworld after a fight. He was just gone. So I downloaded the game, unzipped the .zip file, and ran the executable, but it didn't work. The disclaimer and "Neo-c Productions" showed up, but then all i got was black screen. Based on the fact that the audio was playing, I think the game was running properly, I just can't see anything. Help? An update: it still doesn't work, even after restarting my computer. I can confirm that the game itself is working fine; I managed to make it past the character creation screen, but I still can't see anything that's happening. Also, after character creation, the game crashed, so I have a crash report now. The battle system is based on Super Mario RPG, which is nice to see brought back in some form, but the prototype didn't show off any kind of surprising twist on this - which was what I was looking for specifically. 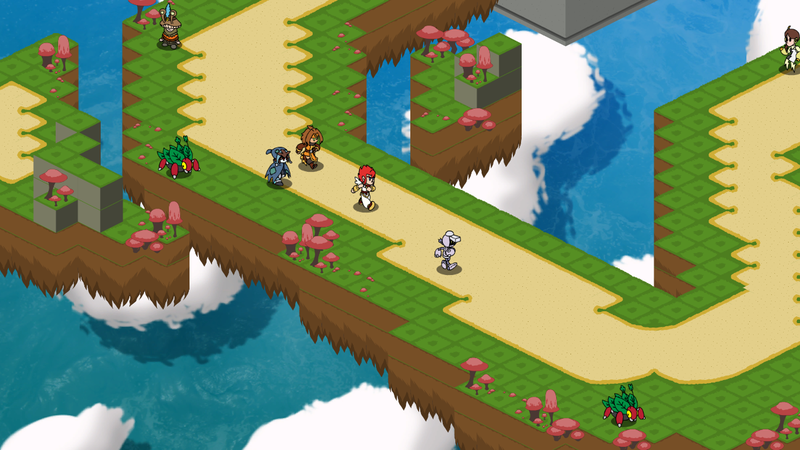 I always question the decision behind building 2D turn-based RPG projects in Unity rather than RPG Maker MV. Using Unity for this genre never feels like the optimal decision when a more tailored engine already exists. There will always be a lot more development to be done in Unity for features that already exist as default in RPG Maker MV, I don't think I'd ever be able to shake off that knowledge if my next project used Unity to make a 2D turn-based RPG. I remember the TOME web-series, it was very good for an amateur project, not sure how it will translate to an actual game. The name "Terrain of Magical Expertise" still feels like a forced acronym from disjointed words; from the offset it had the branding of an amateur project with the name alone, it's going to be incredibly difficult to shake that off and build quality branding to sell this. The project itself has a lot of very high hurdles that need to be overcome (comes with the genre), the prototype doesn't give an indication that it is capable of doing this (likely because it is a very early prototype and is very bare-bones, it would be unfair to expect a prototype to demonstrate everything). I'm worried that this prototype was revealed not because it would demonstrate the special selling point of the game, but because the development hit an implementation milestone, which worries me as I'm not seeing much here that can't be built in RPG Maker MV in less than a month in terms of systems implementation. $75k is no-where near enough to develop a turn-based RPG; needs about 3x that at minimum (and that's a stingy minimum for a team of 5). I've seen projects with more experienced teams and larger budgets fail with this particular genre. It's an incredibly demanding genre for writing, systems design and artwork - especially if it's a 2D game where the amount of artwork needed will exponentially grow overtime. I'm guessing the Kickstarter is supplementing additional starting capital, rather than supporting the entire development. I'd very much like to see a prototype 2. So my buds and I did a video of this game the other day and gave our thoughts as we played. Myself, an avid TOME fan, my roommate with a casual familiarity with TOME, and my third person with no experience with TOME, here to judge the game clearly on its own merits. 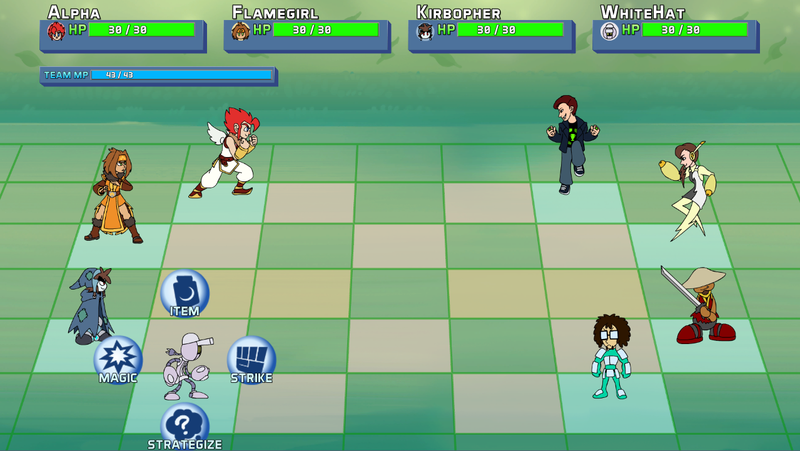 - I did not notice any bugs during my playthrough as a Crystal Cybernetic Brawler on a PC. In any case, what I was able to play was amazing, although I'd advise that you state that the space bar will initiate dialouge. I was randomly pressing buttons for a little bit before I figured it out. Overall, I'm loving everything! BUG: A Game freeze bug. It happend during the battle with matpat and the others, after i defeated him i put kirbo on defense by stradegy and the game just stopped. I found a pretty fatal flaw in the game, MatPat is in it. BUG: During the Rockoon fight the White-Hat Hacker was defeated right before its turn. It then still allowed me to have my turn before going back to the defeated sprite. From this point I could no longer do anything in the game because it seemed as though the game thought it was still White-Hat's turn. I was playing humanoid nature spellcaster if thats anything to do with it. -Otherwise loving it so far! hey kirb i love the demo its soo cool the only problem i found was well there is a few but its related anyway here i go . after i made my animalistic weponary infernal and i clicked yes to finalize it, it stopped for a bit then it took ages to get into the game like to get to alpha flamey and kirb then whenever i started a fight it took about a few mins to get into the fight then took longer to get back to get to the overworld after finishing the fight could you possibly fix this? these may be issues your team may or may not be aware of. monitors as well. The backgrounds from the demo did not have this issue. may want to look into a way to up the res while keeping game file low. when in the party, Kirbopher's battle option commands are cut off. Overall, glad to see what I am seeing. I hope this feedback helps. The one bug i found was clipping into stairs. Heya Kirb! Firstly, the game looks, and the demo is great! Totally backing this. May have encountered a bug though. On the last boss fight, accidentally opened up the settings menu right as the cutscene ended, and could hear it close on the fade to black (intentional close). 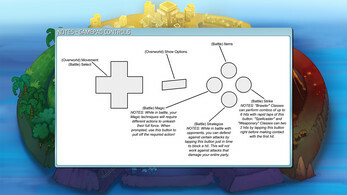 Right after the in-battle cutscene, when the first turn started, there was no longer a display for the action options, and the turn did not progress after the timer reached zero, essentially a soft-lock. Not sure if there is a place for this, but thought it would be good to mention here. This may also just be my own computer borking. But better safe than sorry. Best of luck with everything! I can't wait to play the full game I donated to help.